Resoe aka Dennis Uprock aka Krew has been involved in the music business for more than 20 years. He started out as a hip hop dj in '86 at the early age of 14. He played as a techno dj in the early '90s, but around '94 he focused more on deep house. during that time he played more or less in every underground club in his home town of Copenhagen. In '97 he started to work in the legendary record store, but now closed 'loud music', which were on the institutions of the Copenhagen underground music scene. Around '98 he bought his first sampler, which was the beginning of his interest in music production. In '07 he decided to start up his own label 'baum records'. this would create a platform for his own and other artist releases. In '09 he started up a new project together with Echocord Boss Kenneth Christiansen. The project 'pattern repeat' will be where both Dennis and Kenneth will produce music together. Walking The Deep Line is a track that fuses Dub Techno & Deep House. The track starts up slowly and locks into a nice groove, after the break a fat bassline enters the stage that will pack the floor for sure. Polarized takes you back to the Detroit Heritage but with a Broken Beat. The nice chords and beautiful atmosphere from the melancolic mood, fits together in a perfect way. 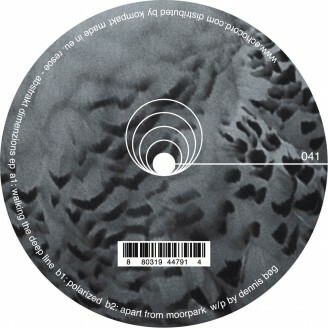 Apart From Moorpark is a Dub Step track that fuses Dub Techno & Dub. The way to descripe this track is more like Dub Tech Step. The track is driven by a hypnotic melodica and a deep fat bass.